Wow! Best hostel I've ever stayed in! The beds are so comfy and they really keep everything so clean! They serve very nice breakfast and also dinner is good. Everyone who works there is so kind and helpful and you can arrange al sorts of tours through the hostel. Location is also great. Near the pub street if you want to party. Could have stayed for ages! Thanks! This hostel is an hotel. So luxurious! Very nice pool on the roof and the staff is super kind! Loved it! Great hostel. Very luxurious and very attentive staff. Would definately stay here again !!! Heel mooi en nieuw hostel. Goede kamers en mooi zwembad, dat wel erg vol is in de middag. Algemene ruimte (en hostel) is groot maar daardoor ook niet heel sociaal. Anderen ontmoeten doe je vooral bij de dagtrips. Decent place to stay, somewhat clean, toilets are always clogged as they don’t have bins or a bum gun. Athmosphere bit dull as there isn’t really a place to hang out and meet new people. Great if you want to get some rest though. The ‘new’ hostel. 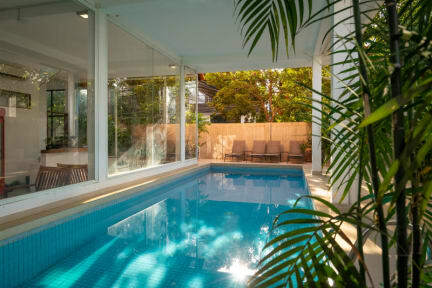 The facilities are great, the beds are amazing, the staff is really helpful, and it’s in the centre of Siem Reap. I only missed a proper ‘hangout’ to meet people. The common area was relaxed but not really social. But you meet people when doing a tour. Hostel with great facilities and a good location. It’s not super communal, probably best if you go there already knowing some people. Staff that is always willing to help and make sure you have the best stay. Nice and clean dorms with enough privacy. Very busy hostel but it isn't an easy place to make contact with other backpackers. Altough there are lots of other people, everyone was doing there own thing. 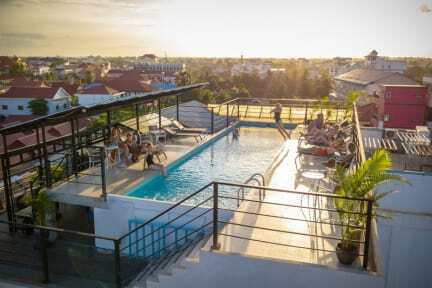 The swimming pool at the rooftop looks good but is too small for the amount of people. The location is perfect, close to the pubstreet, nightmarket en everything else you need! Clean hostel, nice staf and very comfy beds!